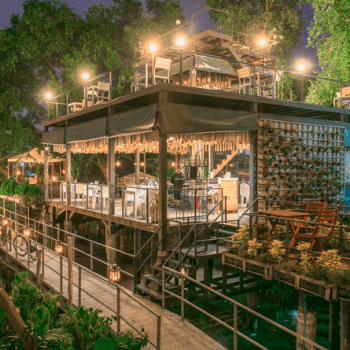 Although Bangkok is primarily a smog-filled urban mecca, there is one place that is purely focused on nature: The Bangkok Tree House located on the island of Bang Krachao. The eco-friendly accommodations vary, depending on which room you choose. If you want to stare at the sky all night, you can get a room that is literally on the roof, with no roof overhead.